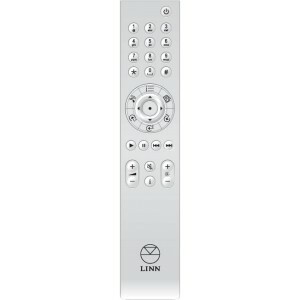 Linn REM 020 Replacement Remote is the newer slimline universal handset retaining most of the functions offered by originally supplied handsets that are no longer available. The remote offers full function control of all full width Linn components including Unidisk, limited function control of Ikemi, Genki, Classik's, Mimik, Majik, Kolektor, Pekin, 5103, and simple source scroll and volume for Kairn, play functions for Karik and station select for Kremlin. The following functionality is available on Linn DSM devices with Infra-Red control. If IR is not currently enabled on the Linn DSM, this can be done via Linn Konfig. This IR handset can be used with ALL Linn DS/DSM products.